Electronic components have a number of electrical terminals or leads. These leads connect to create an electronic circuit with a particular function (for example an amplifier, radio receiver, or oscillator). Basic electronic components may be packaged discretely, as arrays or networks of like components, or integrated inside of packages such as semiconductor integrated circuits, hybrid integrated circuits, or thick film devices. 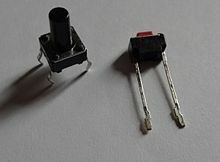 The following list of electronic components focuses on the discrete version of these components, treating such packages as components in their own right. Varicap, tuning diode, varactor, variable capacitance diode – a diode whose AC capacitance varies according to the DC voltage applied. Battery – acid- or alkali-based power supply. On a circuit diagram, electronic devices are represented by conventional symbols. Reference designators are applied to the symbols to identify the components. ^ For instance, a computer could be contained inside a black box with two external terminals. It might do various calculations and signal its results by varying its resistance, but always consuming power as a resistance does. Nevertheless, it's an active component, since it relies on a power source to operate. ^ What is a Thermistor. U.S. Sensor Corp.
Wikimedia Commons has media related to Electronic components.